A man brought traffic on Istanbul's July 15 Martyrs' Bridge to a halt briefly late Monday after shooting his gun into the air and parking his car facing oncoming traffic. The man, identified as Metin Yılmaz, was detained by security officials after attempting to stage a protest over a personal financial matter with a family member. Reports said that the man was a veteran who had suffered major injuries during clashes between Turkish security forces and PKK terrorists in 1994. 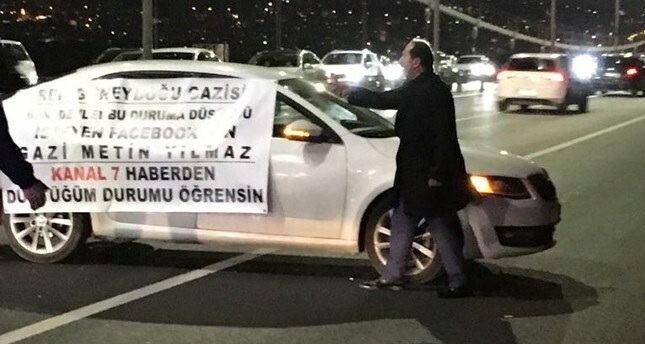 A photo from the scene showed the man standing next to his car, which was covered with a banner which reads his name Metin Yılmaz, asking people to watch a news report about his plea. In the report, Yılmaz claims that his cousin illegally received his veteran compensation and refuses to give it back to Yılmaz. The veteran further asks government officials to intervene and bring his cousin to justice.